Hellooooo Summer! The Lauterbach family has had a very full social calendar lately (we are just so darn popular ;)). We have had lots of fun with family and friends and lots of eating and drinking. It’s a little exhausting to have this much fun! When you are busy and constantly on the go, it’s kind of nice to have something healthy and hearty in the fridge to grab in a hurry. 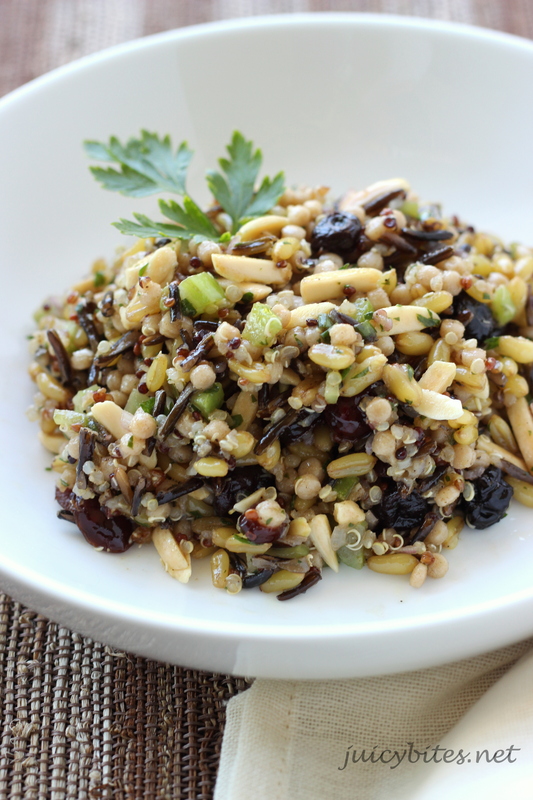 This grain salad fits the bill perfectly! It travels to work (or the beach!) very well. I originally posted this recipe about a year ago. I have made it a few times since then with a few little tweaks so I thought I would re-post it with my changes and some updated photos. This is a really delicious combination of grains! This recipe is a bit time consuming because of all the grains that need to be cooked separately, but it is super simple and so good that it is totally worth it. This makes a great dish to bring to a summer pot luck, or a yummy light dinner served over a bed of greens. My husband loved it over baby kale lightly dressed with lemon and olive oil. 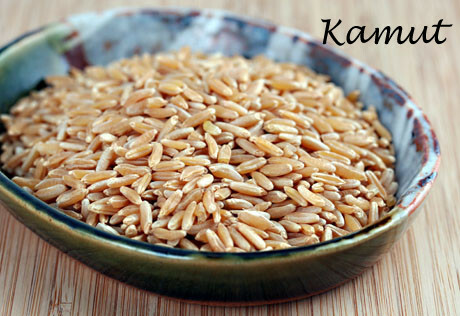 Kamut is related to both durum wheat and spelt, and is pronounced kah-moot. 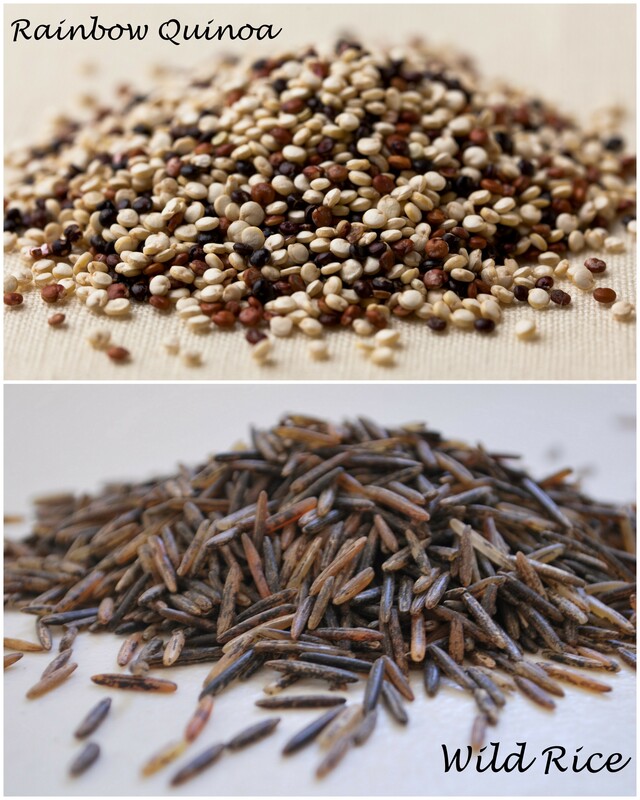 It has more protein, vitamins, and minerals than modern wheat and is about twice the size. I love the buttery, nutty flavor and the chewy texture of this grain. The best way to cook it is to soak it over night (or all day) first. I know that sounds like too much prep to put into such a simple grain salad, but once again…it’s worth it! You can find Kamut in most health food stores like Whole Food’s, or here on Amazon. If you can’t track it down, a good substitution would be farro, barley, spelt, or wheat berries. You should be able to find wild rice, quinoa, and pearled couscous (sometimes called Israeli couscous) in any well stocked grocery store. Pearled couscous is just a larger version of regular couscous. It’s closely related to pasta (made with durum wheat) and has a slightly chewy texture. It is simple to prepare – just like cooking rice. 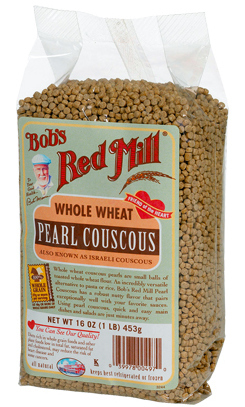 I like this whole wheat variety from Bob’s Red Mill. 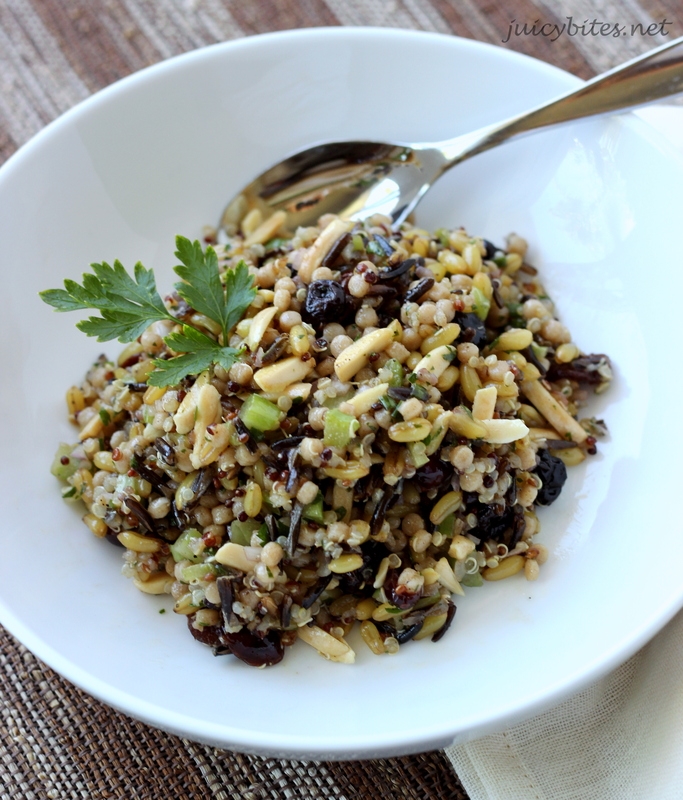 The wild rice adds a great earthy flavor and the quinoa is perfect for a little protein. I like the rainbow variety and it’s pretty easy to find. This salad has a tangy, tart, and slightly sweet dressing that is delicious! Celery and almonds give a nice crunch, and dried blueberries & cranberries add the perfect sweet bite! 2 tablespoons of balsamic vinegar, 1/4 cup of red wine vinegar, 3 tablespoons of fresh lemon juice, 1 tablespoon of Dijon mustard, 1 minced garlic clove, 1 teaspoon of sugar, 1/2 teaspoon salt, and fresh ground pepper to taste. Once they are all well combined, slowly whisk in 3/4 cup of extra virgin olive oil. The first step in this dish is cooking all of the grains. Cook each one separately – according to the package directions. Make sure you add about a quarter to a half teaspoon of salt to each one while it cooks. 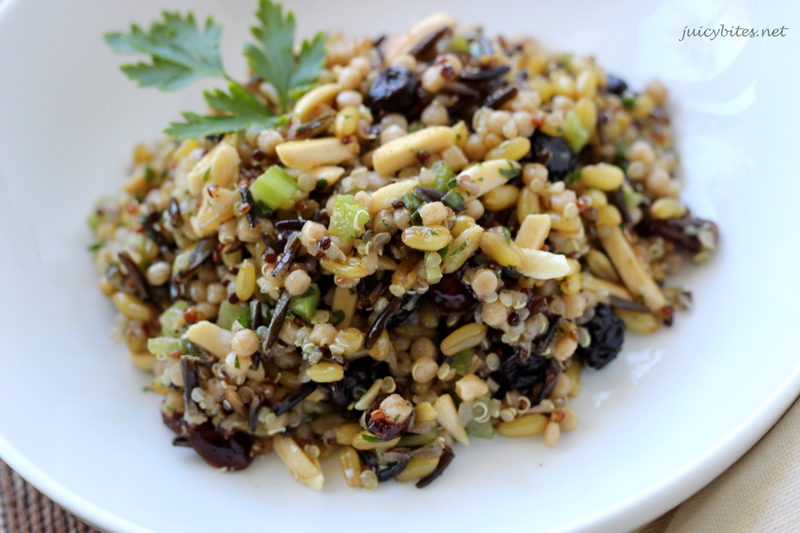 You can cook your grains up to a day in advance, then refrigerate until you are ready to make the salad. Once all of your grains have cooled a little, combine them together in a big bowl. Add the chopped celery, shallots, scallions, parsley, dried berries, and 3/4 of the dressing and mix well. Add more salt and pepper if necessary. To serve right away, add all the dressing and the nuts and mix well. The grains really soak up the dressing, so you will want to reserve a little to add later. If you are serving this later, don’t add the nuts yet, cover and refrigerate until you are ready to eat. Let it get back to room temperature, add the rest of the dressing and the nuts just before serving. Nicely done! I love all the whole grains you’ve used in the recipe – they are so satisfying, tasty, and… healthy!